Michael McNeive is the General Superintendent at Chicago Bridge and Iron. 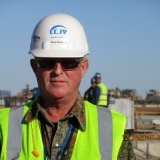 His current responsibilities include drilling platforms, power plants, raw gas conditioning plants, sewage treatment plants and lift stations, general water works projects, cast in place concrete, precast concrete, slip form operations, heavy duty shoring, elevated decks and structures, sheet piling, and underwater dredging. Michael started doing construction in High School and has had a natural progression into his current position, where has been for almost 5 years. The key to Michael’s success has been hard work, determination, hard headedness, and enjoying the success of completing projects. Michael is very generous and donates to many charities, including The United Way, ASPCA, Little Brick Church, Star of Hope, Food for the Poor, Habitat of Humanity and St. Jude's. He received his Associates Degree in Construction Technology from Central Missouri State University, 1976.